You have iOS devices, an iPhone, iPad, iPod or Apple Watch; you want to know what’s going on at home even without being there yourself. You could have your eyes and ears in and out of your house by turning your iPhone, iPad or other iOS devices into IP cameras or using iOS security cameras. We know iOS users could use Manything to turn a spare iPhone or iPad into an IP camera, viewing live video feeds and getting alerts. How Do You View Security Camera on iPhone, iPad or Other iOS Devices? How about iOS security cameras that can be viewed on an iPhone, iPad and iOS devices remotely and sends alerts when something out of ordinary pops up no matter where you are? iOS security camera with iOS apps (iPhone/iPad)! iOS security camera apps are the key ingredients that enable iOS users to remotely view videos on iPhone or iPad and to receive motion alerts via push notifications and email even on the go. Many iOS security camera apps are provided by the manufacturers, such as free and intuitive Reolink iOS app for iOS devices (iPhone & iPad); and third-party iOS apps that are compatible with cameras of different brands, for example, IP Cam Viewer, iSpy. A month ago, a friend of mine approached me asking “is there a decent security camera that works well on her iPhone 6 and iPad?” A wireless outdoor security camera that is remotely accessible and viewable from both her iPhone and iPad. Well, to be frank, there are many iOS compatible security cameras with remote viewing that might meet her need, Reolink Argus, Reolink RLC-410, just to name a few. To help narrow down options, we start focusing on security cameras and systems with iPhone/iPad apps and key features of iOS-compatible security cameras and systems that benefit homeowners or users in the long run. When you are a thousand miles away from home, you want to simply tap into the iOS security camera app and instantly see what your camera sees. Security cameras with remote viewing on iPhone, iPad or other iOS devices prove to be increasingly popular and essential. Reolink wireless security cameras with iPhone remote viewing, for example, RLC-410W, allow users to view camera video feeds remotely not only on iPhone but also on Mac, Windows, and web browsers. Never underestimate the importance of HD resolution on iOS/iPhone/iPad security cameras. HD snapshots and videos not only help with positive identification in the event of break-in or theft, such as looks of stranger, make of unknown vehicles, parked car license plate number, but also provide a true sense of security and peace of mind. For instance, it’s reported that Reolink RLC-410 4MP Super HD iOS outdoor security camera captured looks of a group of package thieves and one suspect was arrested by the Independence Police, according to KMBC NEWS. 5Megapixels IP cameras capture even better & clear videos with resolution reaching at 3072 x 1728, for example, RLC-422W 5MP dome iOS home security camera. You might not be able to stare the screen/monitor or watch the camera on your iOS devices, iPhone or iPad 24/7, it would be nice to be alerted or notified instantly when something out of ordinary happens or someone tries to break into your house, that’s why instant motion alerts with a snapshot or video to your iPhone, iPad, or Apple Watch or email box matters. Other than that, you could also respond or scare off any uninvited by speaking through iOS home camera’s microphone if there is any or call friends or police for help to prevent would-be break-in or robbery. iOS home security cameras, such as Reolink Argus 2 – a wireless security camera with iPhone remote viewing, is capable of motion sensing and sending real-time alerts automatically. On the same note, video recordings are essential for surveillance. A video copy of home break-in or package theft helps bring the perpetrator to justice. 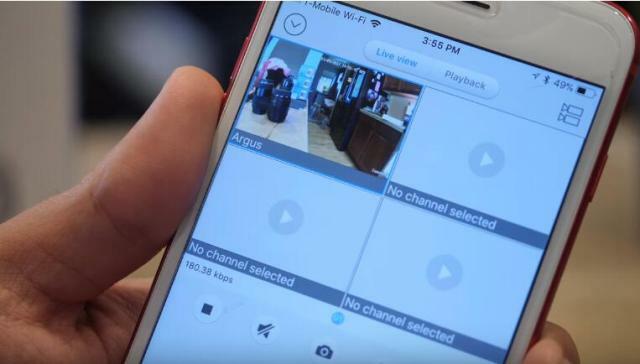 Continuous recordings of what your iOS security cameras see throughout the day help keep track of a sequence of events while motion-triggered recordings either to an SD card, FTP, or a cloud server whittle down unnecessary video clips and save the forensic proof that matters the most. RLC-511W is a decent wireless iOS outdoor security camera that comes with a built-in micro SD card for motion recordings. Night vision capability has become a must feature when homeowners are looking for an iOS security camera that can be viewed on iPhone/iPad simply because IR night vision allows users to keep an eye on their property even when the light is off. IR sensor and infrared LEDs together with IR cut filter enable your iOS/iPhone/iPad home security camera to see things in the dark or low light conditions. Some users fret about two people not being able to view their surveillance cameras on multiple iOS devices either on two iPhones or on both iPhone and iPad at the same time. Choosing security cameras with iOS/iPhone/iPad app that you can share access with others and enable you to view camera video feeds on multiple iPhones or iPads do come in handy, especially when you are unable to check in due to internet issues. Imagine you get more than 2 security cameras and you are able to view and stream the video feeds simultaneously on the same iOS security camera app and SAME SCREEN. That’s amazingly convenient and you don’t need to switch apps back and forth at all. 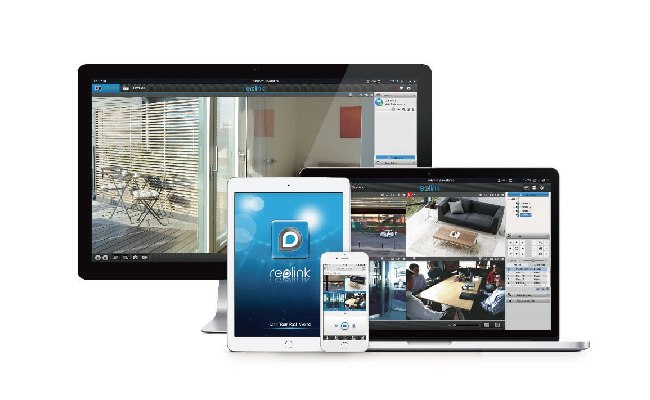 Reolink cameras happen to be managed by one app (Reolink app) and can be viewed on a multiple-camera mode, such 4 cameras quad-view, 8 cameras or even 16 cameras on one screen. Whether you are using your iPhone (iPhone X, iPhone 8, iPhone Plus, iPhone 7, iPhone 7 Plus, iPhone 6S Plus, iPhone 6S, iPhone SE, iPhone 6 Plus, iPhone 6, iPhone 5S) or iPad(iPad Pro, iPad Air 2, iPad Air, iPad mini 4, iPad mini 3, iPad mini 2, iPad 4, iPad mini) to view, stream or manage your security cameras, it’s essential to pay extra attention to the security camera apps’ minimum requirement on iOS operating system. For example, Reolink iOS app Requires iOS 8.0 or later and Reolink iOS app is compatible with iPhone, iPad, and iPod touch. This entry was posted in Buyer's Guide and tagged ios security camera, ios security camera app, iphone security camera.